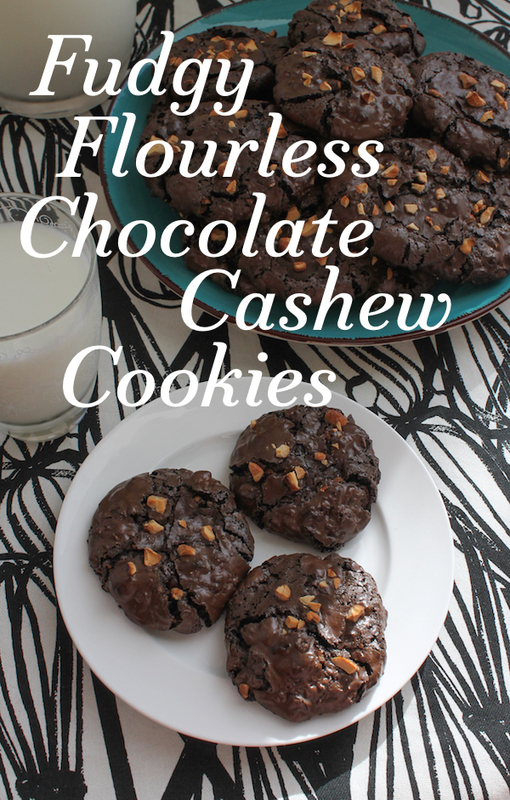 All of my taste testers agree, these fudgy flourless chocolate cashew cookies are GOOD. Better than good. We thought they were fabulous. Crunchy on the outside and wonderfully chewy in the middle. And as long as there are no nut allergies to worry about, your gluten-free friends will love them too. With Thanksgiving nearly upon us, I chose the theme "quick last minute cookies" for this month’s Creative Cookie Exchange. I don’t know about you, but aside from the traditional pecan pie, desserts always take a back seat to the main course and sides at my house. As my elder daughter says, "Thanksgiving is All About the Sides!" 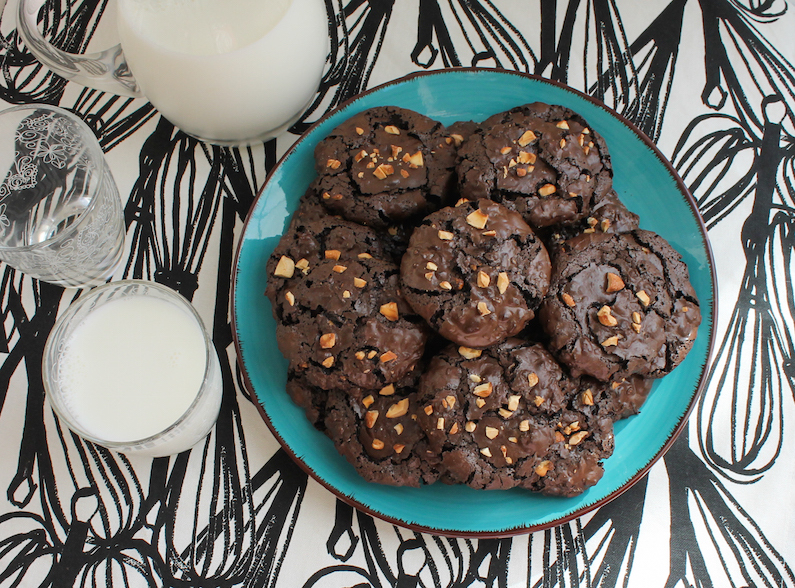 When extra guests show up and that pie won’t stretch far enough, whip up some quick cookies. While these cookies are easy to put together and bake, I am also delighted to tell you that, once baked, they freeze and thaw beautifully, making your life even easier. You are welcome! I named these for the nuts I had on hand, but please feel free to substitute whatever you have in the cupboard. 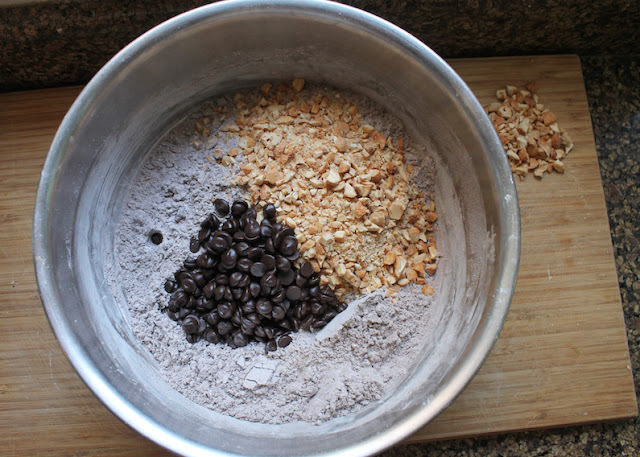 If your nuts aren’t roasted and lightly salted, toast them in a dry skillet and add one half teaspoon of fine sea salt when you sift the sugar and cocoa powder together. 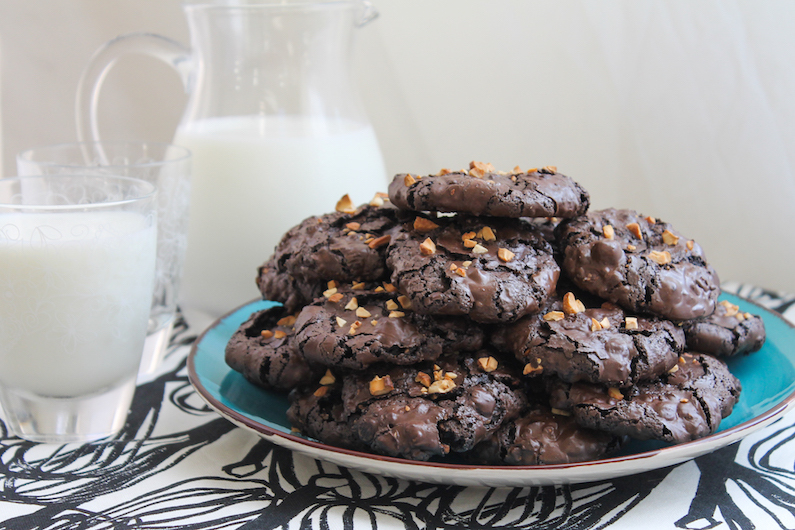 The salt is absolutely essential to balance the sweetness of these fudgy cookies. Preheat your oven to 350°F or 180°C and prepare your cookie sheets by lining them with baking parchment or a silicone mat. 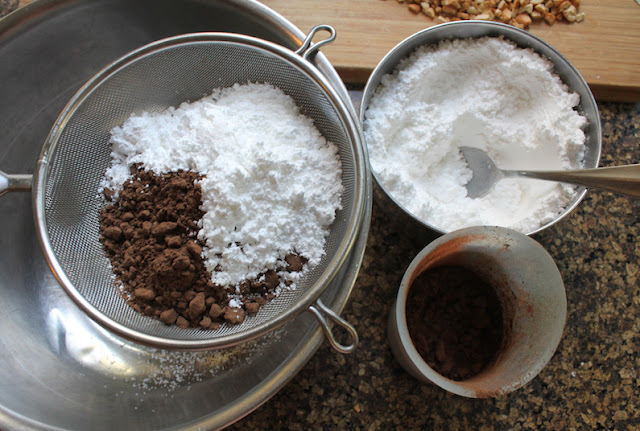 Sift the powdered sugar and cocoa into a large bowl together. 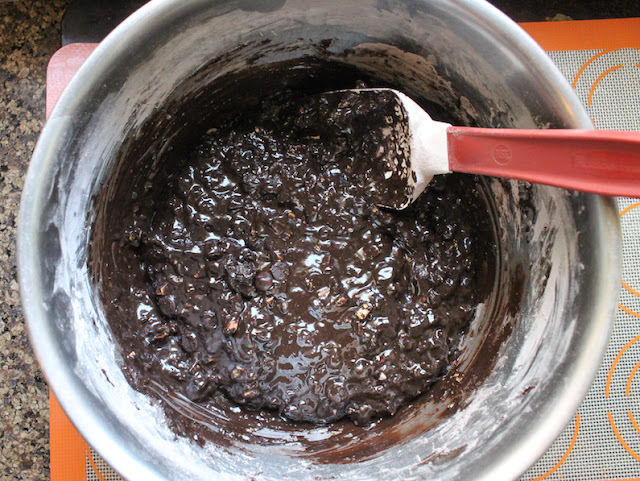 Add in the chocolate chips and chopped cashews, saving a couple of tablespoons of the cashews for topping, if desired. 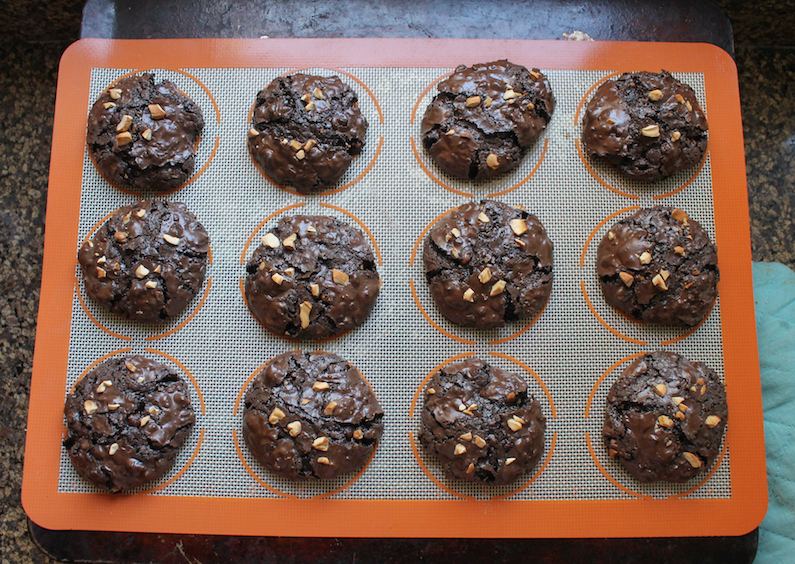 I always like to add nuts to the tops of baked goods if there are nuts inside because 1. They look nice and more importantly, 2. They are a warning to those with nut allergies. No bad surprises. Whisk your egg whites for a minute or so, just to break down the proteins. Pull your whisk out occasionally and let the egg whites drip off. You’ve beaten them enough when they no longer drop off in glops but drip smoothly. I use a small whisk and a measuring jug for this step, which makes the egg whites easier to pour into the other mixing bowl. Pour the egg whites into the sugar/cocoa bowl and stir with wooden spoon or hard silicone spatula till they are well combined. You will think that there are not enough egg whites, but just keep stirring. This batter is super stiff. 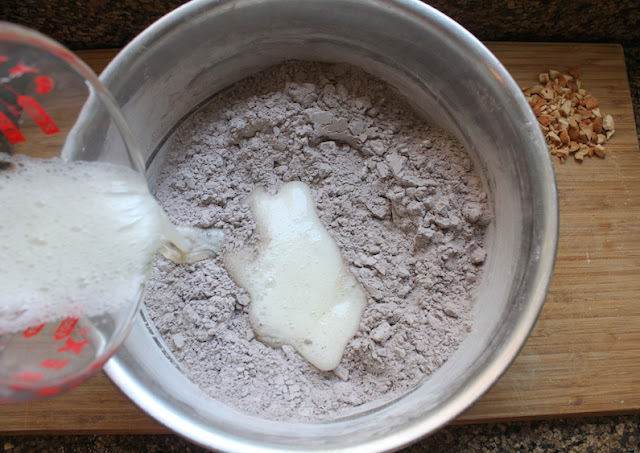 Using a 2-tablespoon or 1-tablespoon scoop (depending on whether you want big or small cookies), spoon the thick batter onto your prepared cookie sheets. Mine was a 2-tablespoon scoop. Sprinkle each mound with a pinch of the chopped cashews, if you saved some. Bake one pan at a time in the middle shelf of the oven for 12-14 minutes for the big cookies or 11-13 minutes for the smaller ones, or until the cookies are cooked on the outside edges and just set in the middle. Do not over bake! 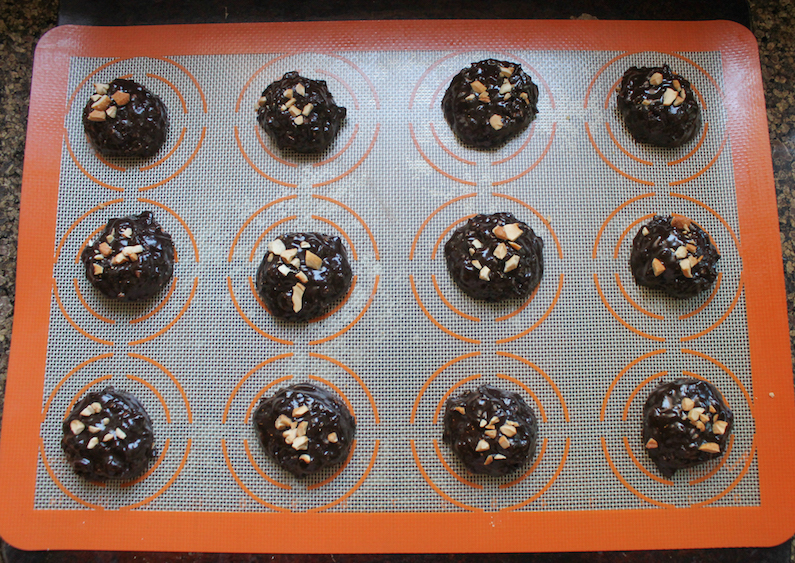 Remove from the oven and allow to cool before removing them from the pan with a thin spatula. 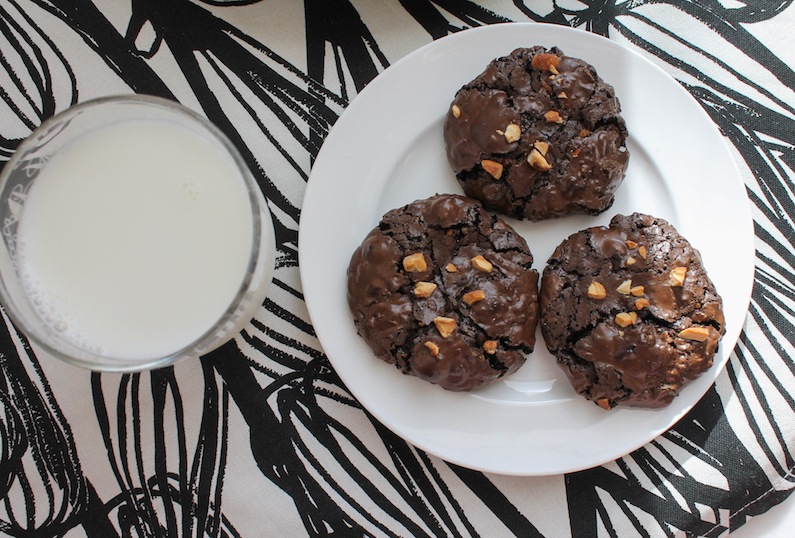 I highly recommend serving glasses of ice cold milk with these fudgy flourless chocolate cashew cookies. A match made in heaven. Check out the other quick last minute cookies, my Creative Cookie Exchange friends are sharing. Such a small but delicious group this month!